Bangladesh Bank Adarsha High School has recently signed an agreement to use FSIBL FirstPay SureCash mobile banking services. Under this agreement, parents of 4500 students will be able to pay their school fees and other dues from home using their own mobile phones. Headmaster of the school Mr. Mostafa Kamal, First Security Islami Bank Motijheel Branch Operation Manager Mr. Mohammad Mostafa and SureCash Manager Mr. Md. 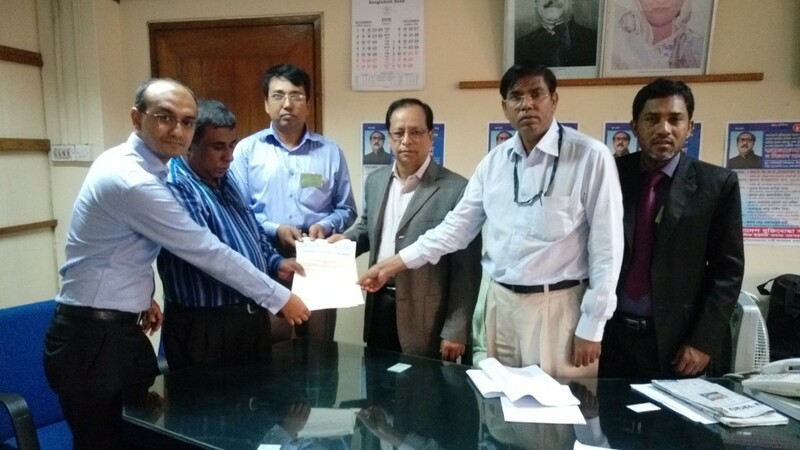 Shafiqul Islam signed the agreement in presence of school governing body president Mr. K. M. Abdul Wadood (GM, Bangladesh Bank) and governing body members Mr. Ashraful Islam and Mr. Munsur Ali. Mr. K. M. Abdul Wadood stated that Bangladesh Bank Adarsha High School is now starting a complete digital payment system using SureCash platform. Teachers no longer have to spend valuable class hours to collect payments from students and parents. This will save time and reduce hassle both for teachers and parents.